TKR Proofing consists of Finnish natural oil based, M1-classified products which are suitable as such for coating wet rooms. There is no need to remove old cast iron wells, but they can be coated during waterproofing with the same product into a seamless whole. When the crack is less than 5 mm, no corner reinforcement tapes are needed on the junctions between structures. Also suitable for waterproofing buildings that are cold during part of the year. Can be used to waterproof the wall structure behind the tiling of the sauna oven as the coating stands continuous temperature of +120 °C. 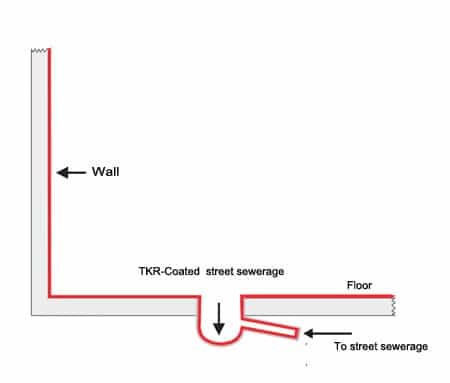 Together, TKR Piping and TKR Waterproofing enable an integrated solution from roof to street sewerage.